The DO Jerez-Xérès-Sherry, located in the province of Cádiz, shares vineyards and Regulatory Council (1933) with the DO Manzanilla-Sanlúcar de Barrameda. It spans the towns of Jerez de la Frontera, El Puerto de Santa María, Sanlúcar de Barrameda, Trebujena, Rota, Chipiona, Puerto Real and Chiclana in the province of Cádiz, as well as certain areas of Lebrija (Seville). The territory has exported wines from as far back as the Roman era, and nowadays it boasts the widest distribution of any Spanish DO, with sales in 50 countries. The prominence of gentle hills, with an altitude of 20 to 100 metres, is an extension of white limestone, with deep and spongy ‘albarizas’ (a white chalky soil used to grow the grapes for sherry wine), which benefits from excellent water retention properties and they generate incomparable conditions for the cultivation of the vine. In fact, they are capable of reserving the rainwater for the dry and hot months of summer. Other types of soils where wines are produced in Jerez at a smaller scale are mud and sand. 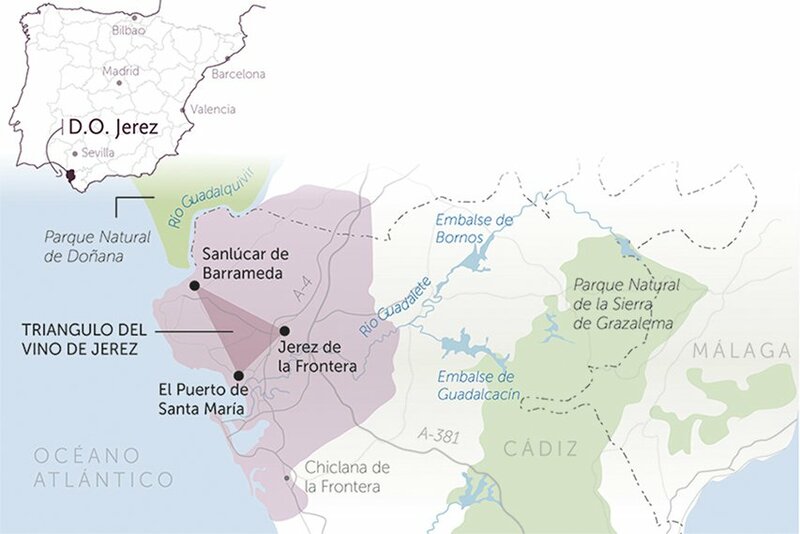 The hot southern climate of Jerez is significantly influenced by the Atlantic Ocean. The average temperature during growing season is 17. 5º C. The area benefits from 290 clear and sunny days a year, but the rain reaches an average of 600 litres per square metre and provides reserves in the soil for the driest months. The wind from the West brings the humidity of the sea to water the vines every summer morning with dew, a factor that helps to soften the effects of the heat and the winds of the East. Only three grape varieties are authorised in Jerez: Palomino Fino (also known as Listán Palomino or simply Listán), Pedro Ximénez and Muscat. The latter two are used to create sweet and natural wines with the same names as the varieties of grape. The greatest distinguishing feature resides in the manufacturing process, also known as ‘the Jerez miracle’, based on the Solera ageing system, a method of dynamic aging in oak barrels which allows the young wines to take on the characteristics of the oldest types. 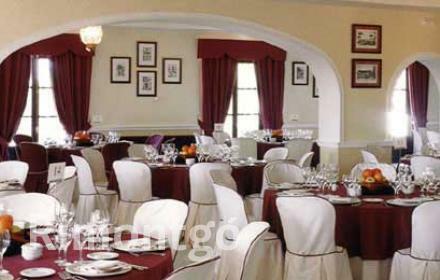 Winery for sale in DO Jerez. Winery located in the DO Jerez region.